Science, Technology, Engineering and Mathematics (STEM) higher education offers unique challenges and opportunities to develop effective blended learning practice. Scholarly research by STEM practitioners in designing evidence-based blended learning designs and practice is essential in its educative capacity of supporting STEM academics to reflect upon and develop their learning and teaching practices. The Griffith Sciences Blended Learning Model provided a “grass-roots” approach to developing evidence-based practice within STEM. Educational design-based research along with interviews of key innovators has provided Griffith Sciences with valuable lessons and insights which have enabled the group to progress and expand its blended learning design practices now and into the future. 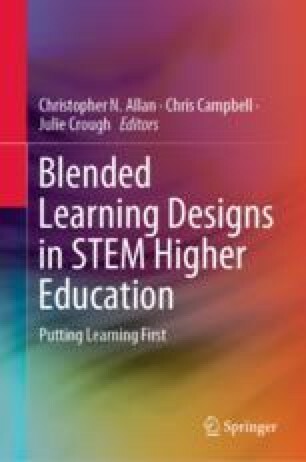 Informed by the range of learner-centred designs and practices explored in previous chapters, this final chapter provides nine evidence-based principles and guidelines for developing blended learning designs in STEM higher education. Although these principles have been derived from one implementation of blended learning technology and in one university for STEM higher education courses, it is tentatively proposed that these principles can support other university implementations particularly in developing ePortfolios or personal learning environments. The Griffith Sciences Blended Learning team would like to acknowledge all of the exceptional learning and teaching staff who participated in the Griffith Sciences Blended Learning Model in 2017 and 2018 including all of the authors in this book. Their dedication and hard work have resulted in some excellent learning and teaching practices embedded across STEM disciplines. Allan, C. N. & Green, D. M. (2018). Griffith Sciences Blended Learning Model. Retrieved November 8, 2018, from https://app.secure.griffith.edu.au/exlnt/entry/6405/view. Foote, K., Knaub, A., Henderson, C., Dancy, M., & Beichner, R. J. (2016). Enabling and challenging factors in institutional reform: The case of SCALE-UP. Physical Review Physics Education Research, 12. https://doi.org/10.1103/physrevphyseducres.12.010103. Herrington, J., Mantei, J., Herrington, A., Olney, I., & Ferry, B. (2008). New technologies, new pedagogies: Mobile technologies and new ways of teaching and learning. In Hello! Where are you in the landscape of educational technology? Proceedings ASCILITE Melbourne 2008. http://www.ascilite.org.au/conferences/melbourne08/procs/herrington-j.pdf.